It isn’t often a video game series will switch consoles - say, from an Xbox to a PlayStation - part of the way though a game's story. The move makes it hard to build a fan base. And it's irritating, especially if gamers don't own both systems. But, whether intended or not, that's what has happened with the widely acclaimed game called "Dead Space." The shoot-em-up game started on the PS3 and Xbox 360. But the story continues with a Star-Wars-style prequel that's only been released for Nintendo's Wii. 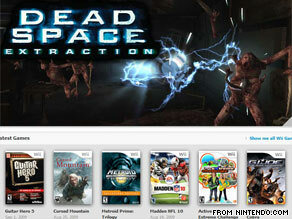 Called "Dead Space Extraction," that Wii game may leave some "Dead Space" fans annoyed. If an Xbox fan, for example, wanted to keep following the game, he or she might have to buy a Wii, which retails for about $250. Or find a friend who owns a Wii. The cross-console narrative happened somewhat by accident. While developing the “Dead Space” game for the PS3 and Xbox 360, executive producer Steve Papoutsis realized they weren’t doing anything for the Wii. He became tasked with creating a game that not only satisfied Wii fans, but took advantage of the unique controllers for the console. Patoutsis said there was plenty of story left untold from the first release, but the challenge was making a game that maximized the Wii system. Many of the weapons are the same from game to game, but the key difference is the perspective of the gameplay. “Dead Space” is played from a 3rd person angle so you can actually see your character. “Dead Space Extraction” is played from a first-person perspective – looking through your character’s eyes. Papoutsis said they hope to open up the eyes of the Wii owners to show them what can be done. He said “Dead Space Extraction” plays best with friends, which the Wii console is intended to do. He emphasized that they did not intend to exclude their fans of “Dead Space” with the new release, but they wanted to create a unique game for owners of the Wii. The game, published by Electronic Arts and developed by Visceral Games, is due out on September 29.